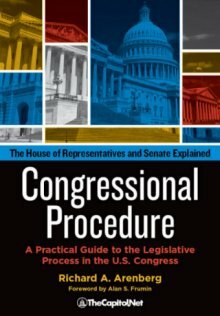 Congressional Procedure explains the legislative and congressional budget processes along with all aspects of Congress. An ideal guide, Richard Arenberg leads the way through the labyrinth of congressional procedure. Having staffed in both the House and Senate, crafted legislative tactics, and taught how Congress works, he can explain complex issues lucidly. [T]he ultimate guide and master blueprint to the legislative process. It may take time to be familiar with the ins and outs of Capitol Hill, but Arenberg gives us a great place to begin and an excellent manual to carry with us on the way. For complete Table of Contents, sample sections, and secure online ordering, see CongressionalProcedure.com.